It's Christmas Eve, oh what fun! Time to relive the Leipzig-Bayern thriller from last season! Shinji Kagawa, Yoshinori Muto and Co. teach their team-mates Japanese... with hilarious results! Hands-free? No, we're not talking about mobile phones but goalkeepers not needing hands to make saves! Heynckes, Löw, Klopp, and the top 10 coaches who scored wonder-goals as players! A rare delight awaits behind door 20 - Ralf Fährmann's best saves, of which there are plenty! Mats the bumblebee? Lahm the lame? What's behind some of the biggest Bundesliga names? A Christmas Robbery? Don't worry, it's just the top five goals from Arjen Robben and Franck Ribery! The Lord giveth and the Lord scoreth goals - that Lord is former Wolfsburg striker Nicklas Bendtner, so here are all his goals in Germany! Five Christmas crackers to light up the home, from brothers Boateng, Kevin-Prince and Jerome. 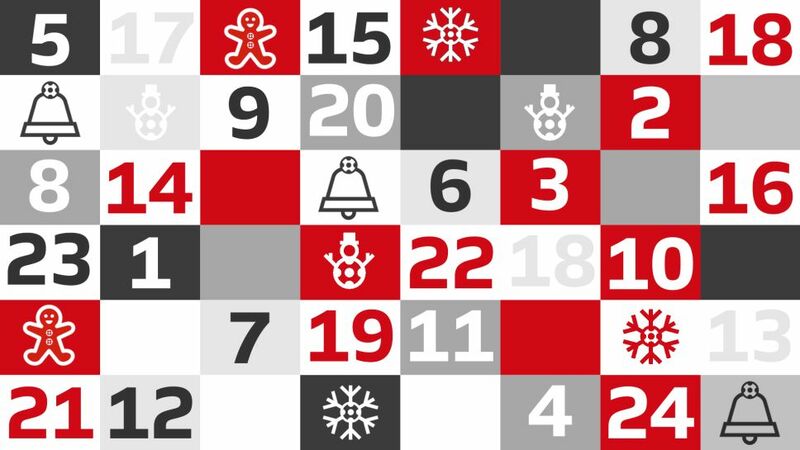 Eight moments between Bundesliga fans and players are behind door eight of the Advent Calendar. Festive cheer from Franck Ribery in August? It can only be the best outtakes from the Bundesliga Media Days! On the sixth day of Christmas bundesliga.com brought me… the top 10 comebacks! Three wise men with lengthy names, you probably know them well. But when it comes to spelling them, are you man or boy...?